A prestigious hall among prestigious halls, The Olympia is the oldest music hall in Paris which is still in use. Its inauguration dates back to 1893, but it is after its modernization in 1954, when all the major artists of the moment began to grace its stage, and that it became a cultural reference point. 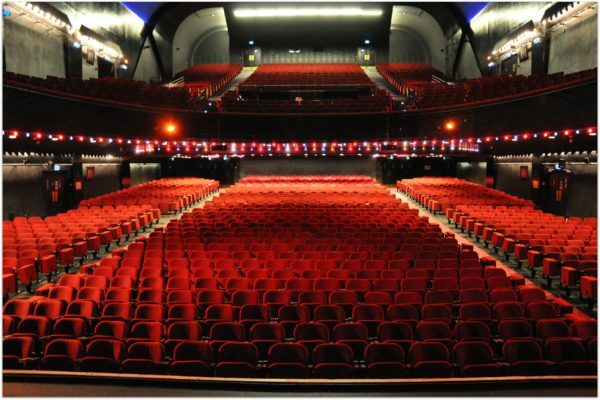 Many great artists have walked the boards of the Olympia: Barbara, George Brassens, Jacques Brel, Edith Piaf, The Beatles, The Rolling Stones … We believe that the greatest legends were built here. To this day it remains a sign of recognition for artists who perform there. Today the room has a capacity of 1985 in a seated configuration and 2824 standing. A very nice room on all levels, it is for us a reference, both for its quality and for its size. 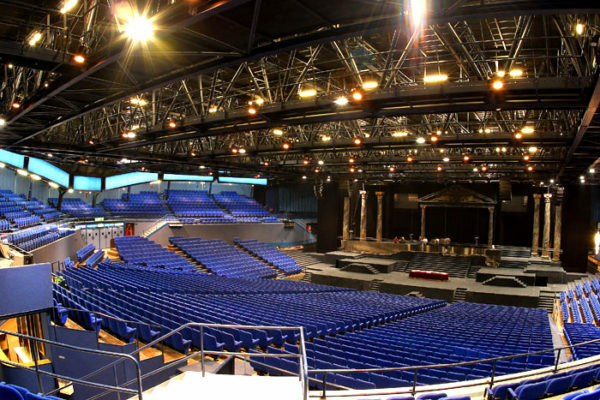 Despite its capacity of about 2000 seats, it still offers a proximity with artists that is very difficult to find in a larger room (such as Zenith or Bercy for example). It is a place for exchange and meetings that creates a very special atmosphere. We strongly advise you to go to the pit, uniquely mounted on springs, and which will inevitably draw you into the atmosphere of the crowd. A place steeped in history, Le Trianon, whose founding dates back to 1894, is listed in the inventory of historical monuments. It is undoubtedly one of the most beautiful Parisian venues. With its red velvet and sculpted balconies, Le Trianon is divided into several modular spaces: the ballroom or foyer, the winter garden, and the theater. In addition to its authentic appearance, the room offers two balconies and a pit of reasonable size providing an atmosphere both intimate and spectacular. It has a capacity of 1000 people. We encourage you to take a walk to the beautiful bar on the right of the stage and pay attention to the pit during rock concerts: the floor moves and sometimes causes seasickness! Built in 1887, this historic monument hall has hosted many artists, including Max Linder. Over the years, it became a cabaret, a music hall, and cinema specializing in Kung-fu and X-rated films. It was not until 1987 that the hall regained its nobility, with decoration signed Philippe Starck and an opening concert by Rita Mitsouko. Since then, this multipurpose room with a capacity of 1000 people has become a reference in the capital thanks to an extremely rich and varied programming. The talents of yesterday and today are jostling for dates. With its magnificent theatrical style, the atmosphere is warm and the acoustics particularly pleasant. An interesting fact: the cafe next to La Cigale in Paris is called La Fourmi, a nod to Jean de La Fontaine’s famous fable. It’s probably the most famous rock hall in France, and L’Elysée-Montmartre got hot, very hot. Totally destroyed in a fire on March 22, 2011, the room finally reopened in 2016. Mathieu Chédid, also known as the singer M, participated in the inaugural evening of this resurrection. In its new configuration, L’Elysée Montmartre can now accommodate up to 900 people for cocktails, parades, shows, and 500 people for sit-down dinners. It has seen rock bands such as the Foo Fighters, Fugazi, Sonic Youth, and David Bowie. It has also hosted many rap stars like Public Enemy, Lunatic or NTM. Other notable mentions are Daft Punk, or Alain Bashung who gave his ultimate Parisian performance there. Le Bataclan was founded in 1864 and takes its name from Ba-ta-clan, Offenbach’s operetta. Classified as a historical monument since 1991, this room was originally a large café-concert hall of Chinese architecture with its pagoda roof. After various adventures, it has become a real reference point for rock concerts, the new wave and one-man-shows. Deeply wounded by one of the most deadly attacks in the history of Paris, The Bataclan is no less one of the most emblematic halls of the capital. She has seen many groups before the fatal attacks of 2015; The Velvet Underground, Jane Birkin, through to Gotan Project. 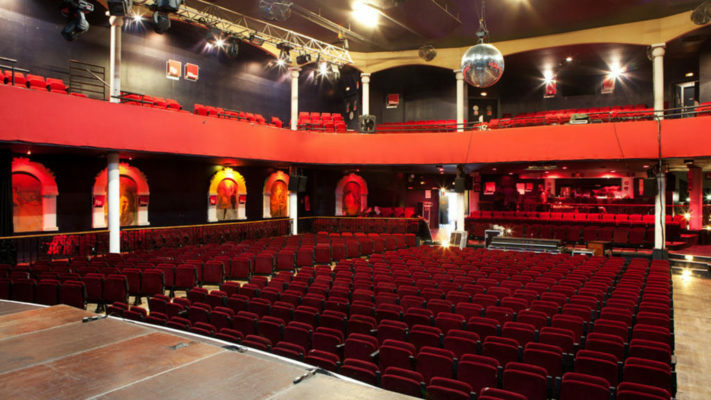 Le Bataclan has come back to life, and is still famous for her eclectic programming and atypical architecture. Located in the heart of the cultural center of La Villette in the 19th arrondissement, Le Zénith combines a modern and prestigious programming, mixing all styles of music. It is one of the capital’s major theaters. With a surface area of ​​6,200 m2, modularity and acoustics, Le Zénith is designed to host popular musical events of importance. Programming alternates between rock concerts, French and international variety, one-man and one-woman shows, and entertainment shows. The biggest stars perform on the Zenith stage. 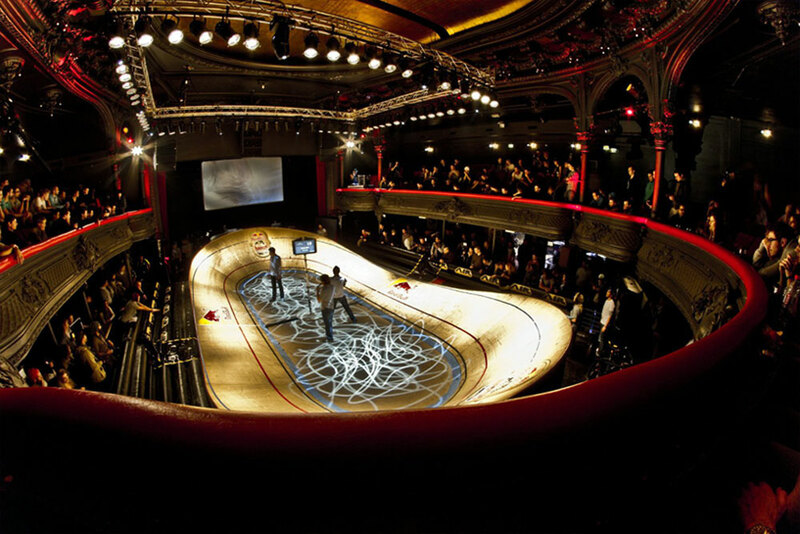 North of Paris, in the 9th arrondissement, the famous Casino de Paris is a must-see venue of the capital. A legend among Parisian music halls, it has seen artists such as Line Renaud and Serge Gainsbourg perform there. 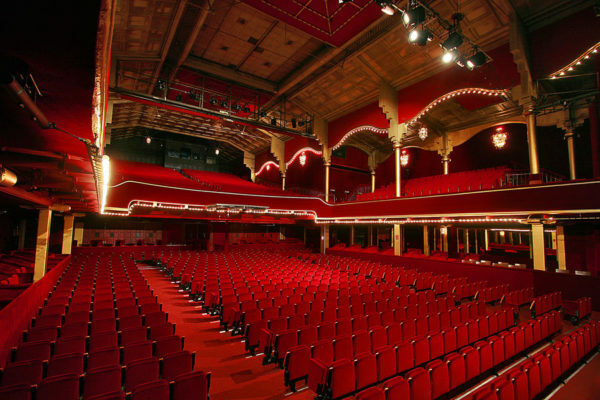 Today, the Casino de Paris welcomes the big names of French and international song and humor. The varied programming also includes musicals and shows of all kinds. Since its opening in 1960, the Palais des Sports, recognizable by its large aluminum dome, is one of the symbolic halls of the capital. With a capacity of nearly 5000 people, this room is one of the privileged places of Paris dedicated to current music. It hosts the shows of the greatest national and international stars as well as world-famous musicals. Located near the outskirts at Porte de Versailles, it remains accessible and suitable for a wide audience. 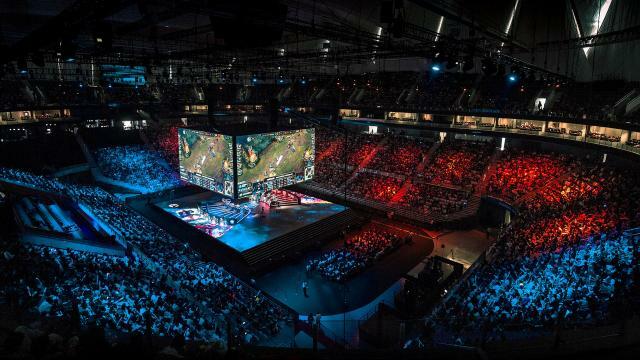 Its arena-shaped hall is popular with artists and spectators for its excellent visibility and human dimension. Formerly known as the Palais Omnisport of Paris Bercy, the AccorHotels Arena is one of the busiest rooms in Paris. Located in the heart of Paris and very easy to access, near the banks of the Seine and the charming village of Bercy, this mythical temple of Parisian entertainment has 20,000 seats. It has received the greatest international and French tours including John Legend, Phil Collins, Johnny Hallyday, Celine Dion, Robbie Williams, Lady Gaga, Julien Doré, but also Metallica and Elton John. It also hosts sports events of the highest level. When an international star comes to Paris or a major football game is scheduled, it’s a safe bet that the event will take place at the Stade de France. This mythical stadiun has seen the biggest sports competitions, but also stars like U2, Bruce Springsteen, Rihanna, Coldplay, Ed Sheeran or Beyoncé. Its oval shape offers special acoustics for large concerts and a panoramic view. 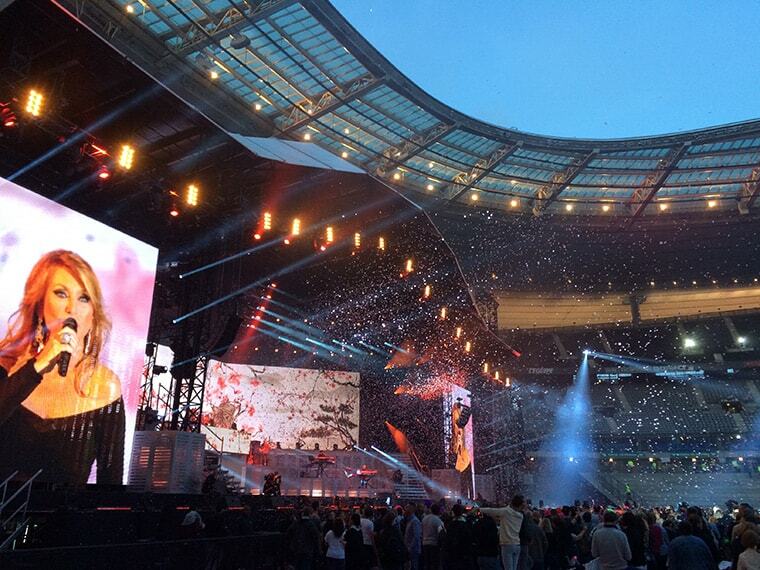 With more than 80,000 seats, and located the northern suburbs of Paris, the Stade de France is one of the reference points for large-scale events.